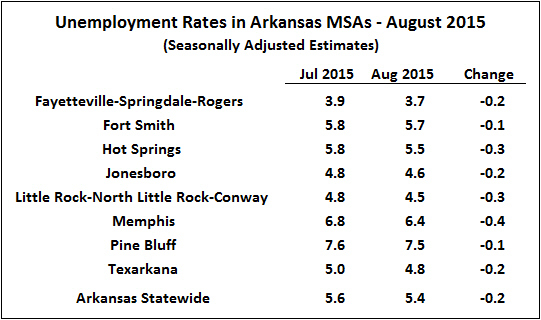 The latest report on metropolitan area unemployment rates came out yesterday, showing unemployment rates down in all of Arkansas’ metro areas. The not-seasonally adjusted data showed that on a year-over-year basis, unemployment rates were down by amounts ranging from 0.5% in Fort Smith to 1.6% in Memphis. The report from the Bureau of Labor Statistics cited a figure that 365 of the 387 metropolitan areas across the country experienced unemployment rate declines since August 2014. As is typically the case, the change in unemployment rates from July to August is complicated by seasonal factors. Not seasonally adjusted data indicate sharp declines of more than half a percentage point in all eight metro areas; however, that is typical of July-to-August changes. Yet even after seasonal adjustment, rates were down around the state. Three metro areas matched the 0.2% decline previously reported for the statewide unemployment rate (Fayetteville, Jonesboro and Texarkana). 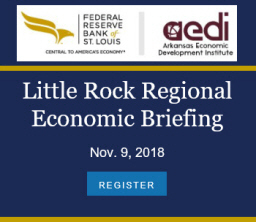 Fort Smith and Pine Bluff saw declines of 0.1%, while Little Rock and Memphis saw even larger drops. Changes in nonfarm payroll employment were mixed. 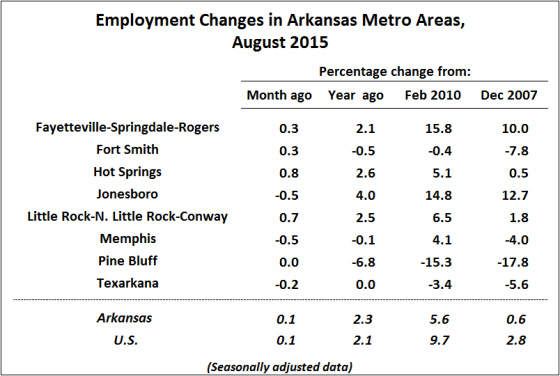 Employment was down by 0.5% in Jonesboro and Memphis, and down by 0.2% in Texarkana*. Employment in Pine Bluff was unchanged, and was up in the remaining metro areas. Gains were particularly large in Little Rock (+0.7%) and Hot Springs (+0.8%). Employment is now higher than pre-recession levels in four of the eight metro areas (Jonesboro, Fayetteville, Little Rock and Hot Springs). *Note: Payroll data for Texarkana (which now include Little River County) are not presently being published by the BLS on a seasonally adjusted basis. Payroll employment figures for Texarkana refer to data that have been seasonally adjusted by the Institute for Economic Advancement.